Claims have remained unpaid even after the stipulated period of two months has long passed. New Delhi: In January 2016, when the Narendra Modi led government announced the new crop insurance scheme – Pradhan Mantri Fasal Bima Yojana (PMFBY) – it had said that one of the key improvements over previous schemes would be that claims would be settled on time. However, RTI data received and reviewed by The Wire has revealed that farmers’ claims worth Rs 2,829 crore remain unpaid for the two seasons that the PMFBY has been implemented. The RTI response of the ministry of agriculture and farmers’ welfare is dated October 10. “A majority of claims for rabi 2017-18 are yet to be estimated/approved by company,” the ministry noted in its response. Thus, for the 2017-18 season, a majority of the data pertains to Kharif 2017 and the data reflects only 1% of the claims paid for the rabi 2017-18 season. For the 2016-17 season, claims of Rs 546 crore remain pending. Claims need to be settled within two months of harvest, according to the PMFBY guidelines. Harvest for the 2016-17 season would have ended in May 2017, at the very latest. For the 2017-18 season, claims worth Rs 2,282 crore remain pending. The data essentially pertains to Kharif 2017-18, as pointed out by the ministry. The harvest for which would have ended in December 2017, at the very latest. Thus, on the date the RTI was responded to, Rs 2,282 crore remained unpaid more than nine months after the harvest period ended, while the PMFBY guidelines require that claims be settled within two months of harvest. For the 2016-17 and 2017-18 seasons, the estimated claims of farmers amounted to Rs 34,441 crore. Insurance companies have paid Rs 31,612 crore, and Rs 2,829 crore remains unpaid. Major insurance companies including Reliance General Insurance, ICICI Lombard, SBI General Insurance, Agriculture Insurance Company (AIC) of India, New India Assurance company are key players in the crop insurance business. State-owned AIC accounts for a major chunk of the unpaid claims. It is yet to clear farmers’ claims worth Rs 1,061 crore. Rs 154 crore of these claims pertain to 2016-17 and Rs 907 crores pertain to 2017-18, effectively only for kharif 2017-18. For the year ended March 2018, AIC’s operating profit from the crop insurance business was Rs 703 crore. HDFC continues to owe farmers Rs 300 crore, while ICICI owes Rs 260 crore. A large proportion of the claims that remain unpaid pertain to Maharashtra, Madhya Pradesh, Rajasthan, Tamil Nadu, Karnataka and Himachal Pradesh. In fact, of the Rs 546 crore that remain unpaid for the 2016-17 season, Rs 257 crore pertain to Karnataka. The state saw a severe drought that year, with 160 of the 176 taluks in the state being declared drought hit. For the 2017-18 season, 91% of the estimated claims in Himachal Pradesh remain unpaid as on October 10, 2018. The corresponding figure for Tamil Nadu is 86% with Rs 124 crore of the Rs 144 crore estimated claims remaining unpaid. The chief complaint of farmers vis-a-vis PMFBY has been that their claims are not settled on time. They argue that they will benefit from crop insurance only if the claims for crop loss for one particular season are settled before sowing for the next season begins. 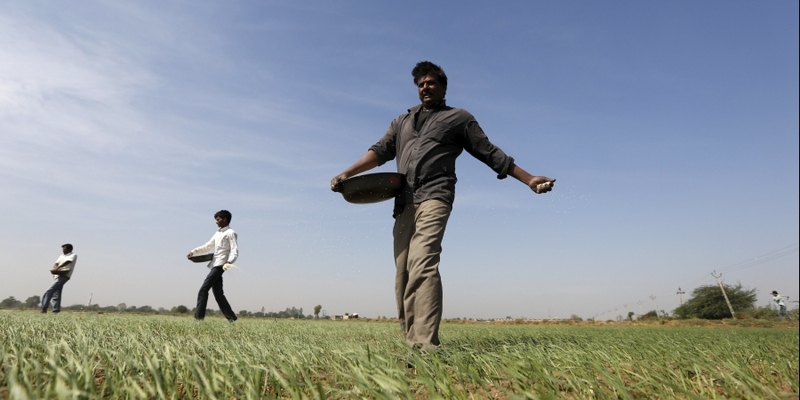 For instance, if the kharif crop is damaged, the claims should be paid before sowing for the rabi season begins. The response to our RTI query is dated October 10, 2018, over four months after rabi harvest ended in May. But, the ministry was not even aware of the estimated claims for the rabi season. To reiterate, PMFBY guidelines require that the claims be settled within two months of harvest. A working paper for the think tank ICRIER authored by Ashok Gulati, Prerna Terway and Siraj Hussain identified some of the key reasons for delays in settlement of claims. They pointed out frequent extension of cut off dates; delayed submission of yield data of crop cutting experiments; delayed payment of premium subsidy to insurance companies, as some of the key reasons why claims settlement is delayed. “The scheme with a noble intention to protect farmers can succeed only if operational guidelines are strictly followed,” they noted in the paper. Siraj Hussain adds that the crop cutting experiments are also disputed. “The results are disputed by companies. So, that is another reason for delays,” he told The Wire. The Centre has also admitted to delays in settlement of claims. Responding to a question in the Lok Sabha in July 2018, it revealed that more than 40% of claims for the 2017 kharif were yet to be paid even when more than seven months had passed since the kharif harvest ended. In September, the Centre attempted to address the issue. It issued fresh guidelines for the PMFBY. The key change was that insurance companies would have to pay 12% interest to farmers if the claims were delayed more than two months over the prescribed cut off dates. The Centre also said that states will have to pay 12% interest to insurance companies if they delayed in releasing their share of the subsidised premium. Kuldeep Tyagi, president of the Bhartiya Kisan Andolan, a farmer organisation that works in western UP, argues that the new guidelines have had little impact. “It has made no difference. Companies are continuing to work as they did before,” he said. “But, no process has even been initiated to compensate farmers for that loss. We have approached district offices but nothing has happened,” Tyagi said.